A Rohingya member of Myanmar's parliament barred from contesting Nov. 8 elections on the basis that his parents were not Myanmar citizens at the time of his birth said on Monday he would appeal the decision and hoped to stand in the vote. The move to deny Shwe Maung, an MP from the ruling Union Solidarity and Development Party (USDP), a chance to run despite being a serving member of government raises concerns about the disenfranchisement of the Rohingya Muslim minority. Most of Myanmar's 1.1 million Rohingya, an ethnic minority living in the country's western Rakhine State, are stateless and live in apartheid-like conditions. Almost 140,000 were displaced in deadly clashes in Rakhine in 2012. Shwe Maung, who planned to run as an independent after not being nominated by the USDP, said that he was informed by state officials on Saturday that his application had been turned down. "It's ridiculous for me," Shwe Maung said. "I was elected in 2010. Now I'm working." According to Shwe Maung, both of his parents were citizens prior to his birth in 1965 and his father served as a member of the Myanmar Police Force. Rakhine State election officials could not be reached for comment on Monday. 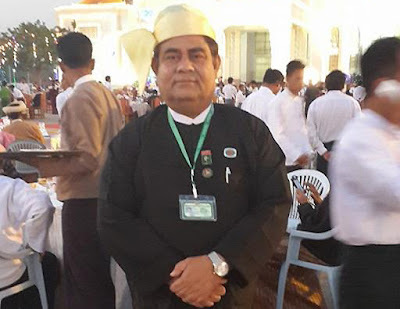 Shwe Maung has represented the majority-Muslim Buthidaung constituency located in Northern Rakhine State near the country's border with Bangladesh since being elected as an MP in 2010. Since 2012, when violence swept across Rakhine, he has been an outspoken advocate for the Rohingya and called for greater citizenship rights for the group. Even if he is able to stand in November's election - seen as a test of the country's reforms process - he faces an uphill battle for re-election. Many of the people who voted for Shwe Maung in 2010 held temporary citizenship documents, more commonly known as white cards. But the white cards were nullified by President Thein Sein under pressure from hardline Buddhists in February. The majority of white card holders were Rohingya. Some former white card holders have been offered new citizenship documents. But earlier this month, Yanghee Lee, the United Nations special rapporteur on human rights in Myanmar, said that she was informed by the country's election commission chair that those who received these new documents would be banned from the vote. Lee said that the decision was of "serious concern".